Gooooood midweek to you, my friends! 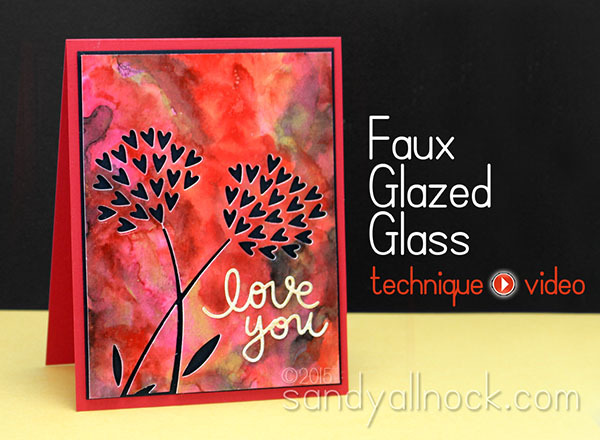 I teased today’s Faux Glazed Glass watercolor background tutorial a bit ago….and sadly, the yummy gold paints are so hard to get, I’ve delayed this post til now. I wanted to wait til they’re in -and now they are! I’ve been having SUCH a good time with these paints. As well as my watercolors. 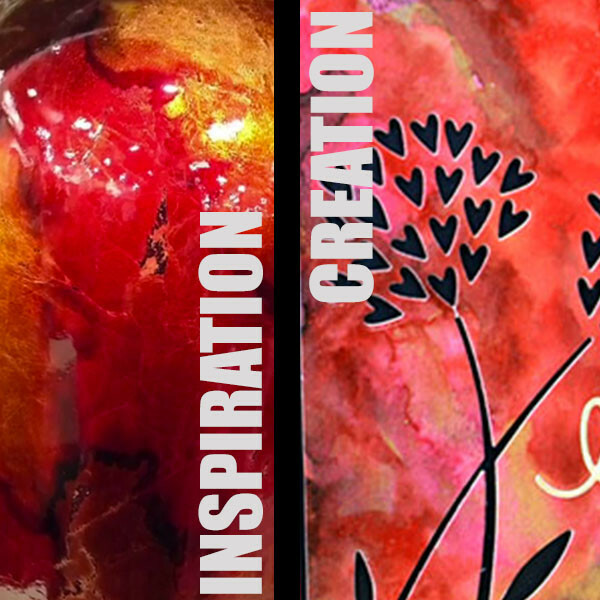 And when I saw the vase pictured in the video – I knew the paints would be part of my CASE! The background really does look like the vase – I surprised even myself! Can you believe this rich color came from “just” watercolors? Check out how I created it in the video below, or click HERE to watch it in HD on YouTube! For those missing my Copic videos – never fear! More are coming. They were crying as I made another watercolor background tutorial, and I’m going to be showing them some love—but mixing it up with other media too. The markers are like kids – they need to learn to share! Heehee! More watercolor background tutorial ideas will be coming in the future…this was too much fun not to play with some more! 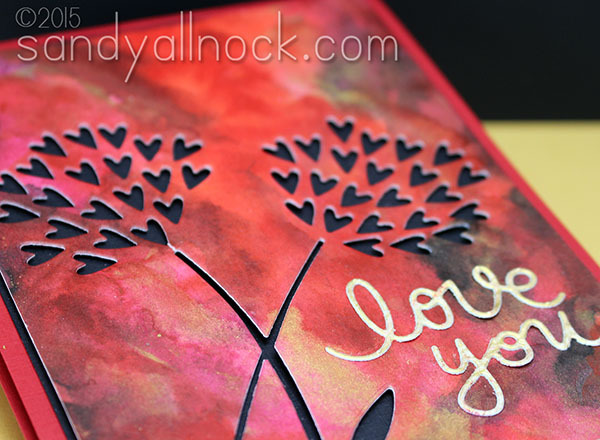 Sandy, I don’t know what other words to describe this ultimately beautiful card you’ve created. I never dreamed you could get that depth of colour with watercolour paints. You are incredibly talented & I’m subscribing today. Love Love Love this, So unique. Can you provide more info on the brushes you used? Can’t seem to the link to work. Thanks. This is beautiful. I enjoyed the video. This is stunning and thanks for the wonderful video! Nummy, nummy background. Nice technique. Beautiful results! For more intricate dies, have you tried the dryer sheet technique? Using them before cutting worked perfectly for me. Using them after has not (yet), however, a friend said it worked perfectly for her. It’s funny what works/doesn’t work for each of us – I always wonder if it’s user errors or if we have different atmospheric pressure, or we’re standing on one foot, or what causes the differences! Its fully possible that my tongue was stuck out in the wrong position! Your colours are so warm and rich with the gorgeous touch of gold. I was so inspired by your video of this technique that I tried it myself with blues, greens and purples. Thank you for sharing so much on your blog and in your videos. I have been watching your videos for a while now and I am learning so much. This background (and card) is so breathtakingly gorgeous! I will have to try this! This is so rich and beautiful, Sandy. I was inspired to create my own ‘faux marble’ background after seeing your video. Thanks for all you share. I have been subscribed and enjoying your videos for several months now but have not taken the time to tell you how much I enjoy them. Your talent is so inspiring. Rich, opulent and wonderful! Thanks so much! Wow this is gorgeous! I love vibrant colors more than anything. Going to try with another die and my Bristol colors (really vibrant). Thanks so much Sandy! Beautiful Sandy – thanks so much for explaining all the steps. I have the watercolors and will give this a try and maybe just use the gold in the set. Just wow! Layers of gorgeousness! Beautiful card. I like the die cut work that you added. You are right Sandy. This is beautiful. Great card and fantastic work.